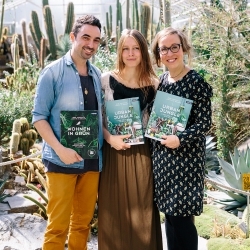 The exciting month of September has kicked off: Not only are we launching our #urbanjunglebook this month in Munich, Berlin, Paris and Amsterdam, but we are also putting a new range of plants in this month’s focus. In September, the ‘Houseplants of the Month’ are not a certain botanical genus or species but a variety of all kind of plants that have one thing in common: their growing habit. In September we are focusing on hanging plants. Hanging plants are truly a highlight in any interior: They add an extra dimension of plant goodness and fit in every room – no matter how small it is. 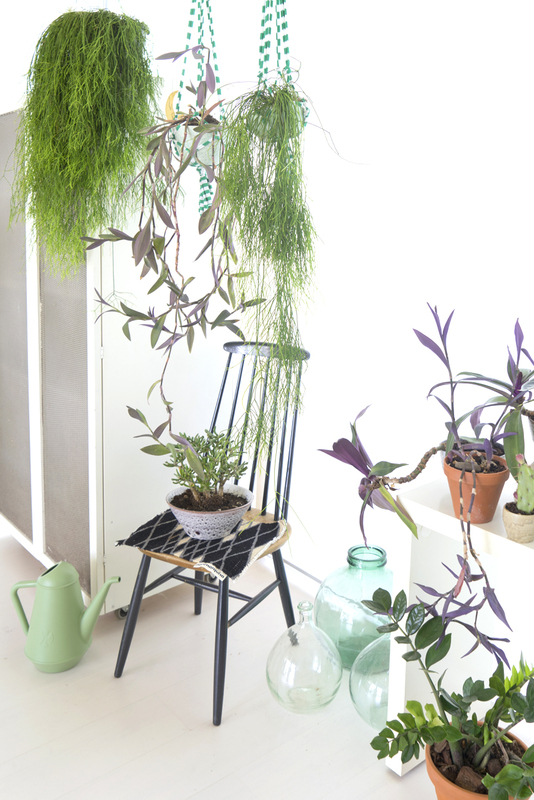 With hanging plants you can surprise and create an extra green corner in a rather unexpected way. Hanging plants vary in their shapes, colours, foliages, fronds – from colourful Tradescantias to gem-like String of Pearls, out-of-space looking airplants or blooming hanging plants like the Medinilla. 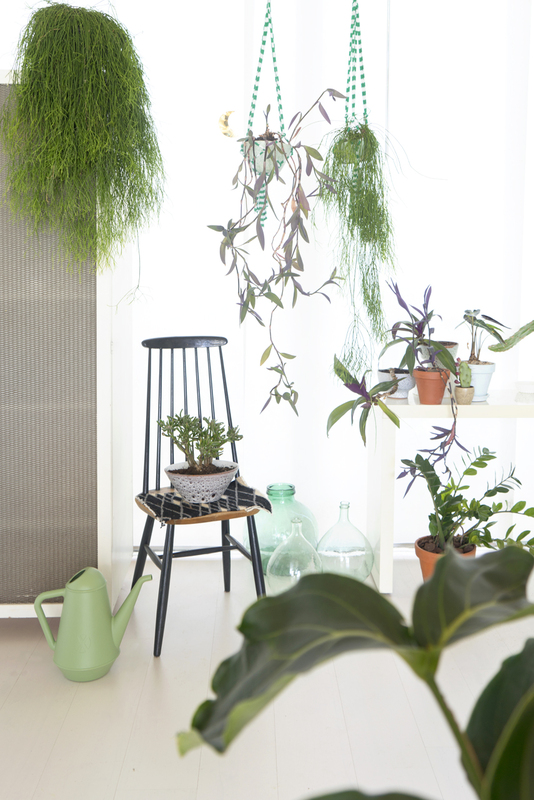 With hanging plants you can play with transparency and the light by creating a hanging garden in front of a window or you can transform a corner into a playful plantarium with an extra dash of colour (for example a painted corner in a room) and mirrors for extra impact. 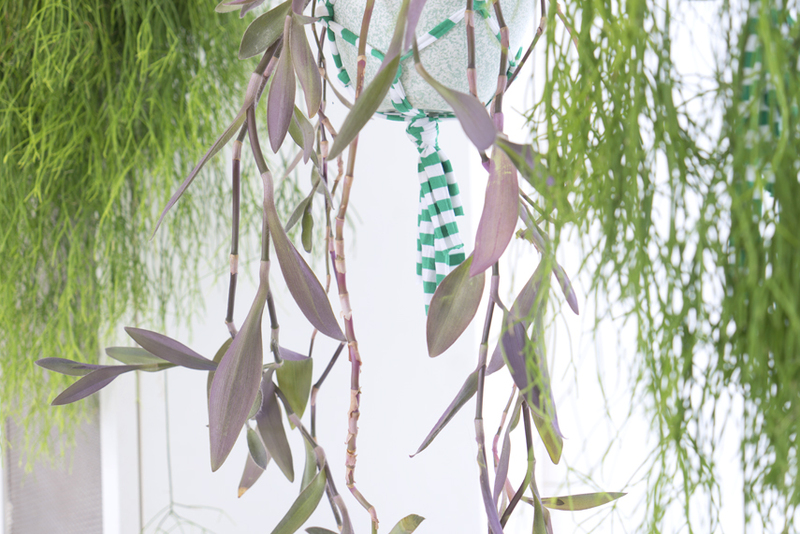 Be playful and create your own version of the hanging gardens of Babylon! Another visual punch can be added with adequate hanging planters. You can opt for modern, sleek glass vessels with leather belts, colourful DIY-pots with natural cord, handmade macramee hangers combined with simple terracotta pots or semi-spheric bowls. 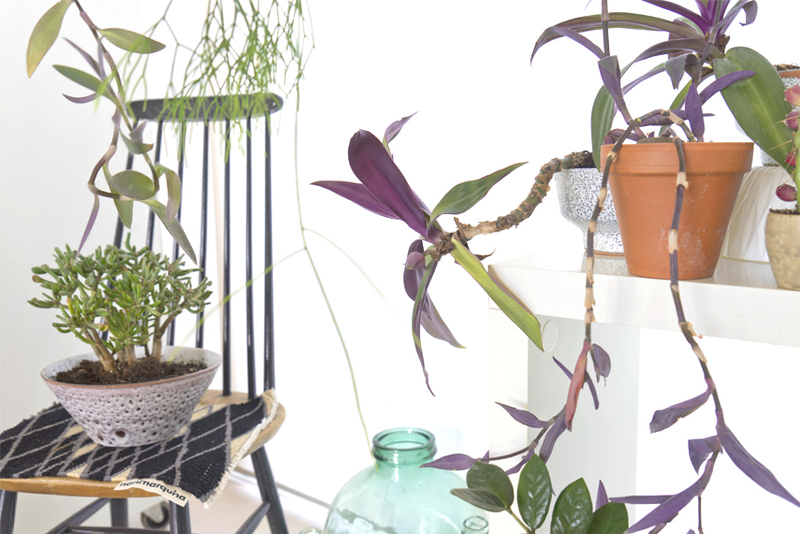 Add stones or crystals to the pots, hang your wooden Bojesen mokey, go wild with accessories and details. You can opt for a streamlined look or embrace a more eclectic mix of styles, materials and colours. You are the stylist and gardener in one. The effect will be unanimous: a beautiful and unusual hanging indoor garden! So which plants can you choose for a hanging garden? Rhipsalis: The wild and messy Rhipsalis is actually a cactus, albeit one without spikes. It grows rapidly with long tendrils hanging down. This plant prefers like all cacti a bright spot and can tolerate direct light, too. The soil can dry out between waterings – be aware that a very sunny spot requires some more waterings than in a semi-shade position. And if the tendrils get too long for your taste or style, you can simply cut them back. This will not harm the plant. 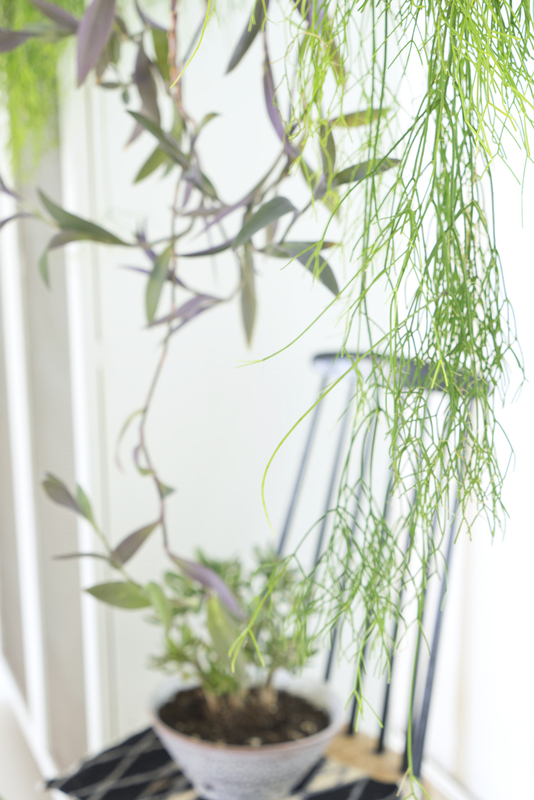 Moreover, the Rhipsalis has excellent air-purifying characteristics! Tradescantia: Tradescantia grows vigorously and fantastically, with pointed leaves which can contain a hint of pink or purple, but also silver and gold. The flowers are ultramarine, white or pink. A hanging Tradescantia in front of a window is an extra highlight: the filtered daylight makes the leaves shine and appear semi-transparent. Water moderately, avoid standing water, soil can be left to dry out slightly between waterings. The variegated varieties should be in a lighter spot in order to prevent the leaf from reverting to green. 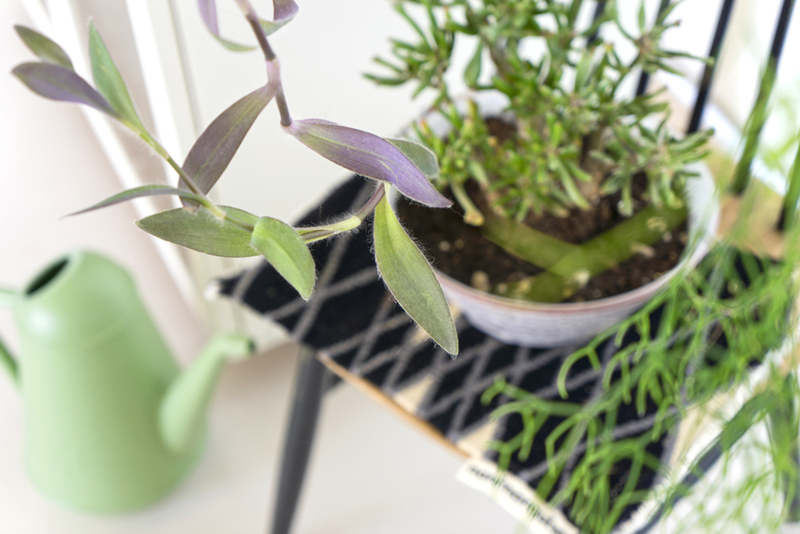 You can play with different varieties such as the dark purple Tradescantia pallida or the beautiful Tradescantia zebrina with it’s zebra-like leaf pattern. 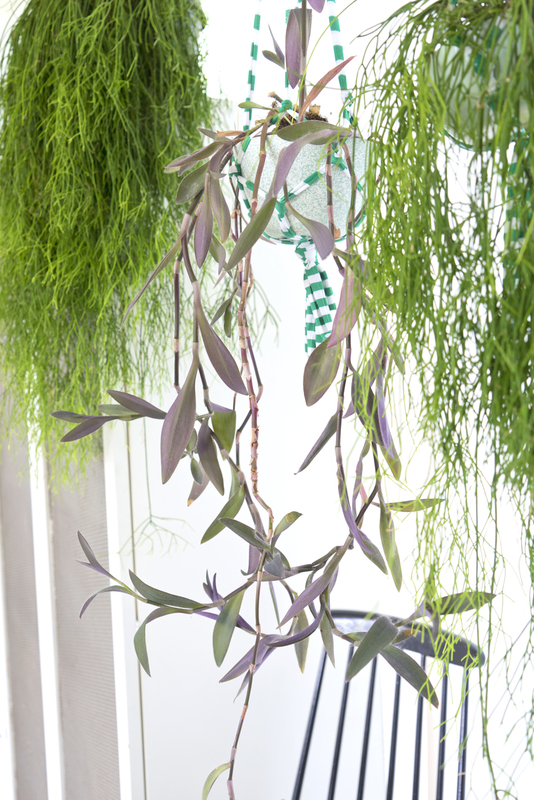 More hanging plant options include the succulent Senecio rowleyanus or String of Pearls, the beautiful and fragile looking Ceropegia woodii (String of Hearts), the lush dark green Aeschynanthus or Lipstick plant with its dark red flowers, all kinds of airplants such as the Tillandsia usneoides or Spanish Moss, the airy Asparagus fern, the indoor vine Cissus, the easy-to-care Epipremnum aureum or Devil’s Ivy, or the flowering Columnea or Goldfish plant. The choice is all yours!